When Republican candidate Donald Trump says we should keep jobs in the U.S., he doesn’t mean what people think he means. 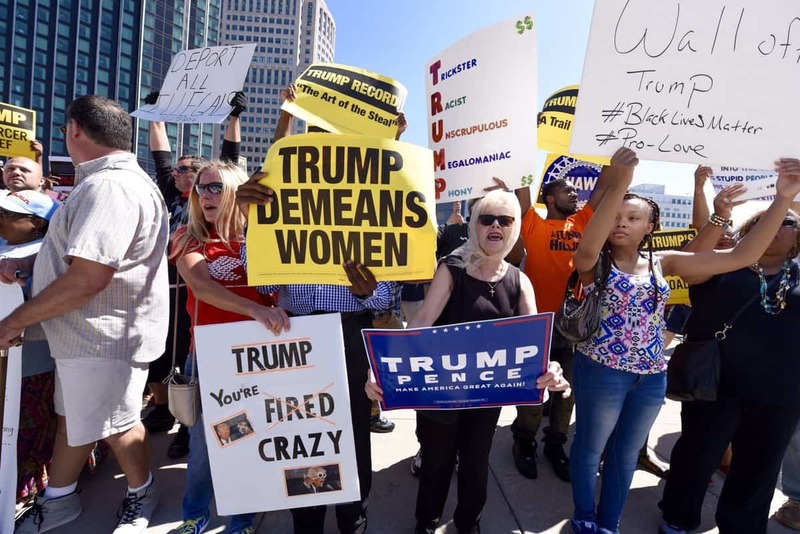 He wants to make the U.S. just as low-wage as elsewhere, to be “competitive.” Members of Michigan People’s Campaign were among those in Detroit who disrupted what was billed as a major economic policy speech Monday to ask him about this and about his treatment of women. Trump talks about job losses from trade. Sounds good, right? But the billionaire businessman’s “solution” is to make wages low enough here that companies don’t move there. Jobs, maybe, but at what price? A year ago Donald Trump, talking about trade, said auto companies should move production from states like Ohio and Michigan to low-wage, anti-union states. He said that after a few plants move (and people lose their livelihoods and their communities are destroyed), then the companies will have leverage to “make good deals” that bargain working people’s wages and benefits down to the point where companies don’t seek non-U.S. alternatives. Got that? Trump says companies shouldn’t have to move jobs and factories out of the country to get low wages; he says they can pit states against each other in a “full-circle” race to the bottom, making wages here just as low as they are there. Then companies won’t want to move there because wages are just as low here. Trump doesn’t want to end the race to the bottom, he wants to accelerate the race, getting us to that bottom ASAP – right here in America. He says we need to stop “punishing companies” and “forcing jobs out of our communities” by asking companies to submit to health and safety regulations and pay taxes and good wages. Some people in Michigan understandably have a few questions about Trump’s plan to drive their state’s wages and working conditions down to make Michigan “competitive” with Mexico and China. It turns out they don’t particularly prefer that their jobs get outsourced to Alabama instead of Mexico or China. So Monday they took those questions directly to Trump. From the first minutes, members of Michigan People’s Campaign disrupted Donald Trump’s Detroit “economic” speech. They stood up and asked him questions about his policies on moving Michigan’s auto jobs out of the state, and about his positions on sexual harassment. They didn’t get any answers. The protesters also wanted answers from Trump about his treatment of women. Trump has made multiple comments disparaging, denigrating and insulting women on the campaign trail – many of them unrepeatable. Fox News anchor Megyn Kelly asked Trump at a Republican debate about him calling women names like “fat pigs … dogs, slobs and disgusting animals.” That led to a particularly bad comment by Trump about Kelly herself. Then Trump started attacking the women who had come forward. “I can tell you that some of the women that are complaining, I know how much he’s helped them,” he said. Trump’s son Eric recently said his sister Ivanka (daughter of a billionaire) would not “wouldn’t allow herself to be objected [sic] to” sexual harassment and that “as a strong person” she would “take it up with Human Resources” rather than take the complaint elsewhere. A daughter of a billionaire might not “allow herself” to be sexually harassed, but what about working women – including top-rated news anchorwomen? “That must be a pretty picture, you dropping to your knees,” he told a female contestant on “The Celebrity Apprentice.” Rosie O’Donnell, he said, had a “fat, ugly face.” A lawyer who needed to pump milk for a newborn? “Disgusting,” he said. [. . .] The New York Times interviewed dozens of women who had worked with or for Mr. Trump over the past four decades, in the worlds of real estate, modeling and pageants; women who had dated him or interacted with him socially; and women and men who had closely observed his conduct since his adolescence. In all, more than 50 interviews were conducted over the course of six weeks. What happens when you press Donald Trump on his positions to cut wages and benefits and his positions against women? In Detroit some people tried. They were “escorted out.” So far, we haven’t heard any answers.